They were putting up the Xmas tree while we were there! We must have overlapped at the Shangri-La for at least a day. They were putting up the tree when we were there too! Just love following you along on this journey. This part of Oman is one of the reasons why I really want to go there. Such a dramatic rugged landscape! And Jebel Misht looks mysteriously enchating — it reminds me of a place in a story book described as a hideout for warriors and their dragons. Something like that. 🙂 Amazing shots, Kelly! YES, I’m pretty sure if you went to Jebel Misht you would find some warriors and dragons!! 🙂 Oman is kind of haunting in that way — so mysterious and deserted and historic and ancient. Can’t stop thinking about it. Always love hearing from you! Thanks! P.S. How many days until you leave?!?!!? Lovely photographs, great to be tagging along on the ride. I am currently in the UAE. I was in Nizwa and Jebel Shams maybe 10 years ago, and I think I stayed in that same hotel, Falaj Daris. You have made me want to return to Oman, I love it there. Will you get to Salalah…supposed to be green there. Where to after Oman? Thanks! Wow, funny that you also stayed at the Falaj Daris so long ago. It probably hasn’t changed much! 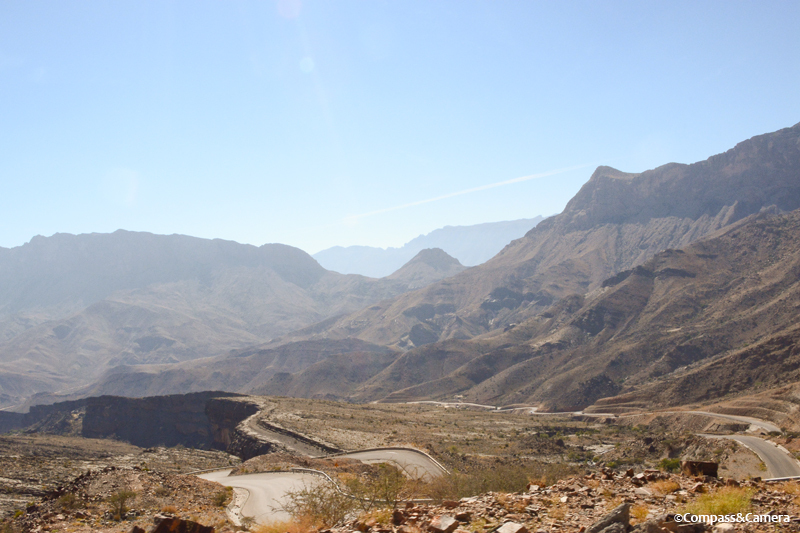 One more post to go on Oman — Nizwa, and some final thoughts. I didn’t get to Salalah, unfortunately. Would love to go back and just camp around for a few months. Oman really got under my skin in a slow and subtle way. When my final Oman post is done, I’ll be posting about a trip I did in February to Myoko, Japan. Not too much to share (snowy photos) but I did see the snow monkeys outside Nagano. So monkey photos are coming up soon! 🙂 How do you like the UAE? I googled Falaj Daris just to see if it was the same…and yes, I stayed there when it was brand new. On Trip Adviser, people are saying it was a disappointment, poor service and poor attitudes. Maybe it changed because when I was there, it was great all around. Yeah, Oman has a way of getting to you. Everything is subtle, but cool. I inadvertently picked up a hermit crab in Oman. We discovered him when he chewed his way out of the plastic bag full of shells. So we let him spend the night in the bidet. I’m sure it’s probably hit or miss, and agree it would have been hard to follow the Shangri-La. We had expected to camp that night, so we were arriving at Falaj Daris from the other end of the expectation spectrum. Just happy to have a real bed! Apparently, everything really is relative. I had just come from a week of camping on top of Jebel Shams. So running water, a soft bed, and well…the bidet all seemed rather nice at the time. The photos send shivers up my spine, knowing I’m seeing such antiquity. Beautiful! And the motel, Falaj Daris, sounds intriguing, if not campy; it really sounds like a scene out of a campy old time film…maybe having Bette Davis slink by in a long silk gown. I have to go click on the link now. Happy you enjoyed the photos! 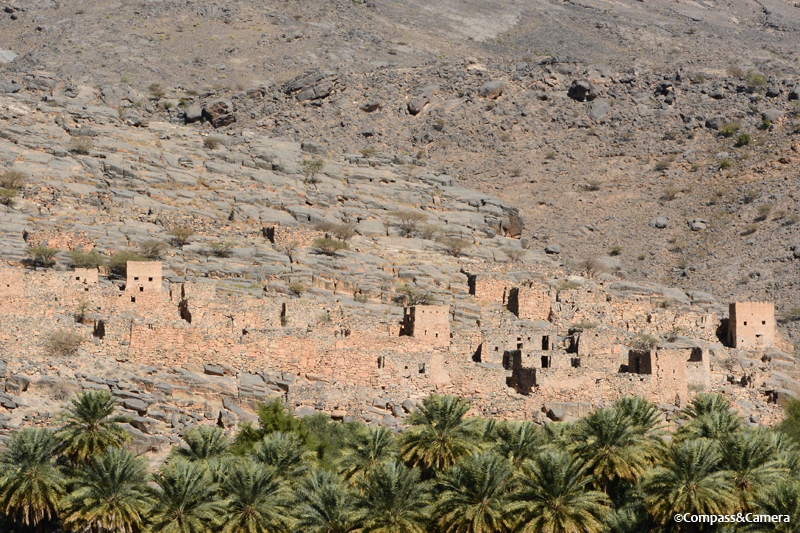 Oman really is an ancient place to explore. Unlike anywhere else we’ve been. It’s gotten under our skin. We’re burning Frankincense all the time now! Haha, thanks Angel! Such a funny hotel in the middle of Oman, but great hospitality! I have never known much about Oman. I really love reading about your travels here. Such a beautiful place! rereading to refresh my mind and explored the images all over again. I love the Terrace Gardes and the stonework cobbled streets…just as great second time round. Good piece. “an express route past all those amazing sedimentary layers” – very clever.